It’s this writer’s view that voice command and AI isn’t quite ready for applications in commercial technology. Shut up and stop listening, Alexa! 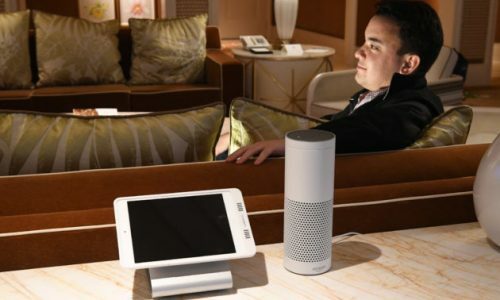 The consumer world is going bonkers over voice command technology (“gadgets,” really). But Siri, Cortana, Alexa, Google, and Bixby are just first generation (more like Beta versions) of it. “Wow, I can turn on lights, raise the temperature of my home, play music, set alarms, check the weather, place calls”…and the list continues to grow. All of this information our AI friends collect goes out to the cloud and, thick as thieves, they’re sifting through relevant content and re-marketing it back to us. You are an amazing resource of information for voice command technology itself. Now, is this technology ready for prime time, commercial technology spaces? In my opinion: NOPE! Sure, we can use voice command to turn the lights on and lower the shades. Besides those, though, there’s not much more they can do in commercial technology. It is very unfortunate typical touch screen became an over-complicated technology – mostly due to the overzealous geek programmers that insisted on fitting every button and command available onto the control panel pages. We’re just not at the point where we could use AI smoothly while establishing an audio or videoconference, displaying a laptop or PC, etc. Think of all the voice libraries that would have to be “trained” for true voice recognition across all forms of voices, languages, accents and dialects. Will we establish some universal form of voice commands? And are any of our corporate clients going to allow “microphones” in conference rooms that are open to the (public) cloud? And I misspoke earlier, this technology is actually second-generation audio control. I believe the first gen went something like this: “Clap On – Clap Off”. Disagree with this viewpoint? Check out a case for the future of voice command technology in the workplace here. AV projects and helping companies grow their business within the AV market and is also an Adjunct InfoComm Faculty Member. Like all new technology, it’s never a ‘par one’ course. In our development environment, Alexa shows good promise for simple conference room control actions including on/off, source select, volume +/- , selecting presets. It is certainly not ready for control of PC apps yet but the announced collaborations between Microsoft and Amazon to increase Alexa-Cortana integration will likely bring an important next step. I don’t disagree with the broad-brush of Mr. Maione’s conclusion but do think that there are limited-scope applications that are quite near market-ready for some audiences. Thank you for weighing in, Jim! I think you may appreciate listening to a debate on this very topic between Maione himself and another industry vet who thinks that AI is far more relevant to AV right now. You can listen to that debate here.